Independence Incorporated is pretty excited to have a Canadian racing champion on staff! That hardware looks really great! 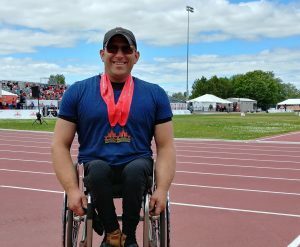 Colin Mathieson just came back from Ottawa, where he won gold in the 100 and 200 meter races at the Canadian Track and Field Championships July 6-10, 2018. We sat down with him to find out a little about his journey to this race. This was Colin’s 24th Canadian Track and Field Championship meet. In it, he competed against Canada’s best. Scores from this meet will be part of determining who goes to World events such as the Paralympics. With competitors such as Isaiah Christophe in the race, Colin says “I knew exactly who I had to beat”. The weather has been hot all across Canada this summer, and Ottawa was no exception. The race days were all in the 40 degree range, testing endurance. But once back on the track, muscle memory and training kicked in. Colin started training again in January. “Once you are back on the track you know that if you just keep going, everything will work itself out”, he says reassuringly. A positive that came from the experience of missing racing for so long was a recommitment to entering as many races as possible. Trips to year-round tracks are in the offing. From the meet, Colin earned three sponsors – Cranked Energy Bars, Jackson Springs Water, and K2B Clothing Company. Others are in negotiation. He has his eyes on Dubai for the World Championships in 2019. Independence Incorporated will definitely be cheering him on.